First of all, I want to give a big thank you to I Breathe I’m Hungry blog for popping up on our Pinterest feed and giving us the inspiration to cook this delicious meal. We have adapted this recipe a bit, and there are unlimited ways you could make this. Think of the cauliflower mixture as the base, and the veggies as your toppings. I’d love to try a spinach, tomato and ricotta variation, or sausage, peppers and onions. Even just adding some fresh basil would be delicious. It is a bit of prep work, I’m not going to lie to you, but it is so very worth it. What a perfect gluten free replacement to the Friday night pizza order. The best part? You can make ahead of time and freeze it. Just throw it in the oven when the time comes. And you know what else? The kids love it, AND they are getting there vegetables in. That’s a win-win-win for any parent. Preheat oven to 350°. Prepare your cauliflower and garlic cloves and lay on baking tray. Add olive oil, salt, pepper, garlic powder and heavy cream and bake for about 10-15 minutes or until cauliflower is browned but still a bit crunchy, stirring occasionally. Sautee your spinach and mushrooms separately, each in a small cast iron pan with about a tablespoon of butter in each on medium heat. Add a bit of salt and cook until wilted. Once your cauliflower is done, remove from oven and allow to cool a bit. 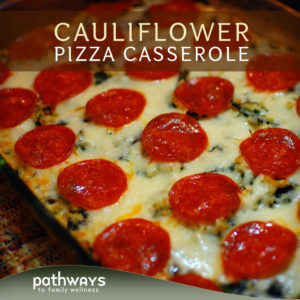 Add cauliflower mixture, 10 slices of pepperoni, 1/4 cup of mozzarella and a bit of salt and pepper to a food processor. Pulse a few times until it is chopped, but not mushy. You will want some chunks left. Combine cauliflower mixture in a 9×13 inch baking tray with your sauteed spinach and mushrooms. 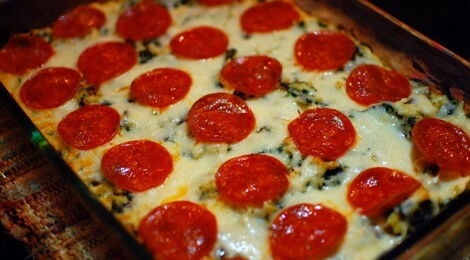 Top with 3/4 cup of mozzarella, then your 20-some slices of pepperoni (depending on how many you want). Cover with tin foil and bake in 350° oven for another 15 minutes or until cheese has melted and edges are browned.